Golfer’s elbow, or medial epicondylitis, is a condition we provide elbow treatment for. It is generally tendinosis of the medial epicondyle of the elbow. This type of elbow injury will involve the forearm flexor muscles that run from the inside of the elbow into the hands. Tissue injury happens when tight muscles and tendons pull on the attachment point of the bone, causing pain on the inside of the elbow. Golfer’s elbow is a general term and refers to pain on the inside of the elbow. 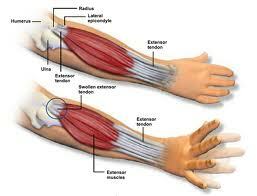 The anterior forearm contains several muscles that are involved with flexing the wrist, fingers, and thumb. The tendons of these muscles come together in a common tendinous sheath. In response to minor injury, overuse, or sometimes for no obvious reason at all, this point of insertion becomes inflamed and painful with gripping or wrist rotation. Tennis elbow, or lateral epicondylitis, is a painful condition of the elbow caused by overuse, and another elbow treatment we regularly provide services for. This condition is characterized by injury to structures in the extensor forearm muscle group and tendons that connect to the outside of the elbow. Not surprisingly, playing tennis or other racquet sports can cause this condition but several other sports and activities can also put you at risk. 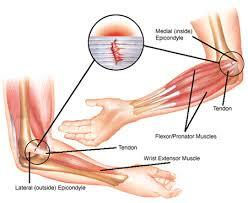 Tennis elbow is an inflammation of the tendons that join the forearm muscles on the outside of the elbow. The forearm muscles and tendons become damaged from overuse — repeating the same motions again and again. This leads to pain and tenderness on the outside of the elbow. Repetitive motions are the most common cause for this common condition with the extensor carpi radialis muscle most commonly being involved. When microscopic tears occur to the extensor muscles and tendons from overuse, pain and inflammation occur. Peripheral nerve entrapment syndromes involve compression of a short segment of a nerve at a specific site as it passes through fibrous or muscular tissue. Injury of the nerve typically occurs as a result of compression by the overlying structures. Another mechanism of injury involves traction — or pulling of the nerve — as it travels and changes direction around soft tissue structure points. 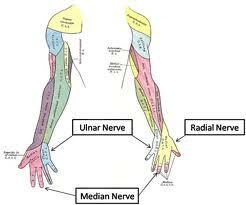 In the elbow region, the most common entrapments involve the median, radial, and ulnar nerves. Nerve entrapments in the elbow are fairly common conditions. Symptoms typically involve numbness, tingling, and weakness into the hands. At times, symptoms of sharp electrical pains can travel down the nerve pathway. The distribution of symptoms helps indicate the nerve involved. A median nerve entrapment typically involves the thumb and first two fingers. The ulnar nerve typically involves the last two fingers, and the redial nerve typically involves the back of the hand or fingers. Vascular entrapment syndromes at the elbow level can occur occasionally. These entrapments typically happen to the brachial artery in the cubital fossa or in between the biceps and triceps muscles in the upper arm. Symptoms vary and can be described as an intense burning/throbbing pain in the arms or a feeling of coldness and loss of blood flow into the hands and fingertips. The symptoms typically vary depending on the severity and location of the vascular entrapment. The most common structure causing compression of the brachial artery in the cubital fossa is the pronator teres muscle. Typically, this is the result of repetitive overuse injuries resulting from long term computer mouse use. The most common cause for brachial artery entrapment between biceps/triceps typically will be the result of strenuous elbow flexion-extension exercises. Workouts with heavy biceps/triceps focus, pull-ups, or dips can be common aggravating motions. Bursae are thin protective pads or sacs located throughout the body that act as cushions between bones and soft tissues. They contain a small amount of lubricating fluid that allows the skin to move freely over the underlying bone. At times, friction, pressure, and tension can lead to injury to these sacs. In the elbow, the olecranon bursa can be prone to injury as it lies between the skin and the pointy bone at the back of the elbow called the olecranon. Initial symptoms may be mild. Most commonly, swelling around the elbow will occur with a feeling of joint stiffness. 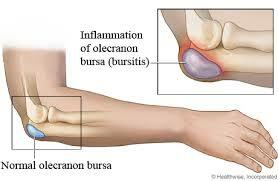 Sometimes there can be no pain at all if the bursa is not infected. If infection to the bursae occurs, redness and pain to touch at the bone will occur. Sometimes these infections can become severe and require surgical intervention if not properly managed. Triceps and biceps strain injuries are relatively common soft tissue injuries at the elbow. Causing a significant tear is a relatively uncommon event. The main cause of a distal biceps tendon tear is a sudden injury. 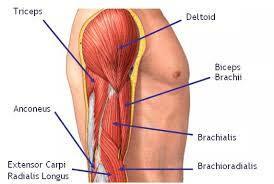 Injuries to the biceps tendon at the elbow usually occur when the elbow is forced straight against resistance. It is less common to injure this tendon when the elbow is forcibly bent against a heavy load.